CRUD (Create, Read, Update and Delete) are one of the most important operations for a web application. 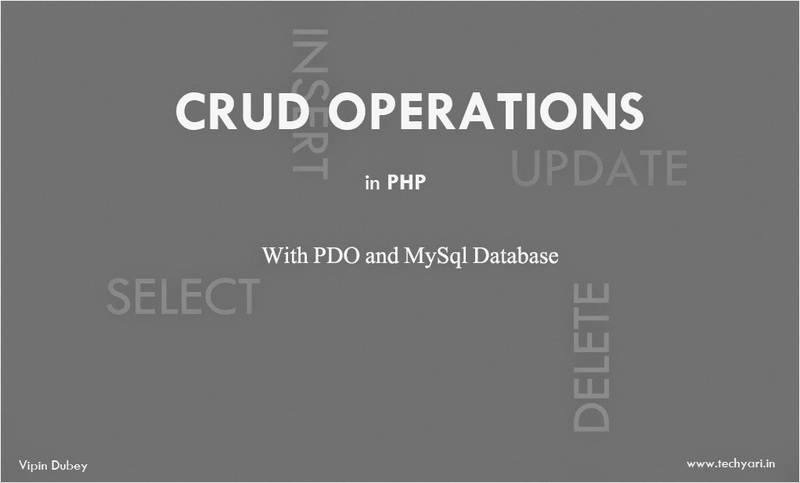 In this tutorial, I will show you how to use PHP with PDO and MySql database for CRUD operations. I will be creating a simple quotes app where a user can publish a quote he likes. The homepage will contain a list of quotes with links to Update and Delete each quote. To keep this tutorial simple and focused to CRUD operations I have left validations for user part, it means anyone can update and delete the quotes. If you would like to make it secure you can go through one of the earlier tutorial Role base login in PHP with MySql and implement session control to make it secure. Lets start with creating our table first. Create a table called demo_quotes with two columns (id and text). Take a look at below script if you have any doubts, you can directly run this in sql window of phpmydmin. Use below script to connect to database using PDO. Create a file named database-config.php and paste below code, we will import this file wherever we need to perform database related operations. 1. Display a form to post new quotes. 2. Show a list of posts from database by performing READ operation and display edit and delete links with each quote. 3. Display an editable form when user clicks on edit link for any of the quotes in the list. 4. Show appropriate errors if any based on url parameter. First of all we will include database-config.php at top of this file as we need to perform database related operations. Next we need to define an associative array for our errors so that we can display errors based on url parameters being received from crud.php script. Next we check for action and id parameters in url, if present we display the edit form and if not then we display the homepage. Below is the code for index.php (homepage). 1=>"Please provide values for all the fields"
from the database in a table with EDIT and DELETE links to each of them. This part of code will only run if there is no action parameter present in the URL. We need to make our homepage look a bit cleaner. Copy and paste below style rules in a style.css file and link it properly to your index.php file. 1. Check GET/POST request and retrieve action value ( Update/Delete ). 4. INSERT a new quote. At the beginning of this file we have a variable named action. this variable will hold the data passed by GET or POST request as action parameter. We will compare action variable value to decide which operation needs to be performed. The default would be an insert operation. This is it. We have created a simple website capable to perform CRUD ( Create, Read, Update, Delete) operations using PDO with MySql database. Leave a comment if you have any queries or suggestions. Security is very essential to any web application. SQL injection is a technique where attacker tries to execute malicious scripts on application's database using several security flaws. The easiest way to do this is sending the SQL script via get or post request that do not have proper validation and security filtering on server.In this post we will look at how to prevent sql injection using two main techniques. Lets assume we have a login page having two form fields, one for username and another for password. We will be using POST method to submit this data to the server. When user clicks on Sign in button all the data will be submitted to server and authenticate.php script will take care of validation. You can use PDO to achieve this. Using PDO is considered the best option however it requires the PDO extension to be enabled on you server. Most of the servers running PHP 5.3 or later have this option enabled and if not you can check with you hosting provider and ask them to enable the extension. Using PDO : Below is an example of using PDO to prevent SQL injection. // Add user to session and take him to home page. // Back to login page with error message. 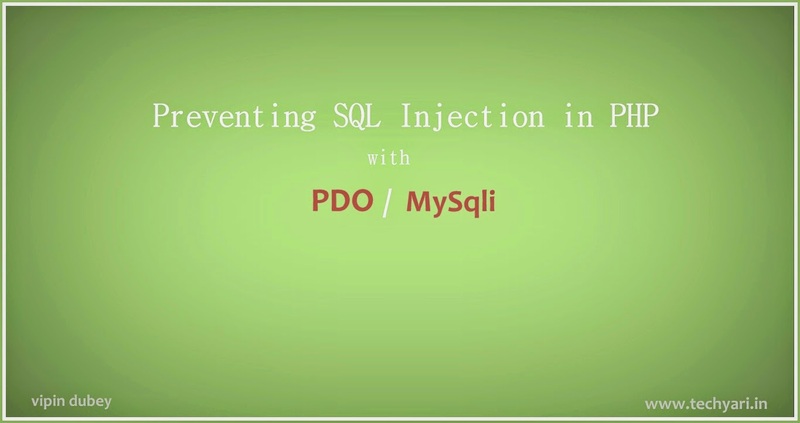 Using MySqli : Below is an example of using MySqli to prevent SQL injection. $result = $stmt->get_result(); // This method requies mysqlnd drives. pleas eamke sure it is available or else you will get errors. // Check number of rows returned from database. // Back to login page with error as username and password does not match. We have seen both ways of submitting data which can save you from sql injection. We also talked about escaping special charatacters which can be used to prevent sql injection as well. Below is an example of how you can escape special characters while getting data from our login page.